Curious George 好奇猴乔治 - ESOL Materials - 英语交流吧论坛 - Powered by Discuz! Curious George is an animated television series based on the Curious George children's book series, which features Jeff Bennett as the voice of The Man with the Yellow Hat. The only recurring character in the original adventures, other than George himself, is the Man with the Yellow Hat, modelled after Adlai Stevenson. It was he who brought George from Africa, and it is in his house that George lives. The Man often facilitates George's adventures by taking him somewhere, and even more often resolves the tension by appearing just in time to get George out of a tight spot. He is always seen wearing a bright yellow suit and a wide-brimmed yellow hat. The Man is never mentioned by name in the original adventures, or in any subsequent content over more than six decades. He is always called either "the Man" or fully "the Man with the Yellow Hat". When people speak to George about the Man, they often refer to him as "your friend." This tradition was broken in the 2006 film, in which the Man is referred to as "Ted" throughout the film and "Ted Shackleford" in a deleted scene. However, in an open-the-flap book titled "See the Circus," published January 1, 1956, H. A. Rey illustrated a man who looks very much like the Man with the Yellow Hat wearing a blue and white polka-dotted kerchief. The caption for the page reads, "Ted has a tricycle, so very small, He cannot ride it, because he's so tall. If you want to find out WHO the rider will be, Just open the flap, and then you will see." Opening the flap reveals two monkeys riding a tricycle. Other mediaTelevisionThere was a series of animated TV films made (beginning in 1980) featuring the character, which were then adapted into books themselves (making up part of the New Adventures series listed above). This series was produced and co-written by Alan Shalleck. A new Curious George TV series debuted September 4, 2006 on PBS Kids as part of PBS Kids Preschool Block. FilmTwo stop-motion animated shorts were made of Curious George stories in 1984, created with puppet-figures by noted animator John Clark Matthews (who later used a similar technique for his films of Frog and Toad). An animated film, Curious George, featuring Will Ferrell as the voice of the originally unnamed Man With the Yellow Hat, was released on February 10, 2006. In this film (in which The Man is referred to as "Ted"), Curious George secretly follows The Man onto the ship to the city on his own accord. Frank Welker provided the vocal effects of Curious George. 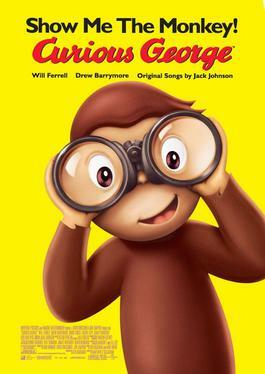 On March 2, 2010, a direct-to-DVD sequel to the film was released titled Curious George 2: Follow That Monkey! On July 30, 2010, Los Angeles Times reported that the studio Illumination Entertainment is developing a new, live-action/computer-animated film about Curious George. Video gameThere is also a Curious George video game that was released on February 2, 2006, published by Namco and developed by Monkey Bar Games, a division of Vicious Cycle Software. OtherA children's bookstore in Harvard Square, Cambridge, Massachusetts, was known as Curious George and Friends (formerly Curious George Goes To Wordsworth), and carried a considerable amount of licensed Curious George merchandise. It was the last remaining property of Wordsworth Books, a former local general-interest bookstore that closed in the early 2000s. This store was closed in June 2011. A new store opened in 2012 at the same address, called the World's Only Curious George Store. The Curious George brand recently (mid-2006) joined with Welch's jelly for a collectible of six jars. In the latter part of that decade (when the new film and the new television show were released), licensing deals for the character generally involved less upscale, more kid-focused products. Earlier, Vivendi Universal (now NBCUniversal) had, for a short time, embraced the use of the character in a series of 2001 ads for the company (but the character never officially became a corporate mascot). In the movie Forrest Gump one edition of Curious George (one with a yellow cover but no other title than Curious George) is used as Forrest's favorite book, which his mother reads to him. In the opening scene a feather comes floating down to Forrest's feet and he stores it in this book. At the end of the film it falls out of the book and rises floating through the air again. Jarrod, the titular character and protagonist from the NBC series "The Pretender", read Curious George books in Season One and developed a fascination with them. He likened himself to George and Sydney Green, the psychiatrist whom he saw as a surrogate father, to the Man in the Yellow Hat. The books have inspired others, for example Bangkok Bob written for and published by Big Brother Mouse, a Lao publishing project. GMT+8, 2019-4-23 06:00 , Processed in 0.210441 second(s), 40 queries .